We are a band of independent and amateur filmmakers in Hong Kong who were both excited and puzzled as to why Snowden chose to come to Hong Kong. While nearly every media outlet wanted to get their hands on him, we decided to produce a short fictional video to depict his experience in HK, and how it would have affected certain parties: Namely, the CIA contingent based in HK who would be tasked to find Snowden. The Hong Kong Police who would be stuck in between the US and China. And the journalists who want to get the scoop. It was also important for us not to 'twist' Snowden's character. We really knew little about him. Although he is a central character, he is not the most prominent. It is more about the maelstrom of events surrounding him. The idea was hatched two days after he revealed his identity, and principal filming began on June 20th. We were also filming on the same day (23rd) when we learned Snowden had left the city. Therefore we ramped up production efforts and published our short film 'Verax' on the 25th. 'Verax' was the alias Snowden used when contacting journalists via encrypted chat services. We loved the idea of having Snowden here and the media frenzy it created. We really wanted to make a film based on such real-life news events, especially as it continued to develop. This project really tested our mettle especially when most of us had day jobs. The plan to spirit the surveillance whistleblower Edward Snowden to sanctuary in Latin America appeared to be unravelling on Friday, amid tension between Ecuador's government and Julian Assange, the founder of WikiLeaks. Correa declared that the safe conduct pass issued by Ecuador's London consul – in collaboration with Assange – was unauthorised, after other Ecuadorean diplomats privately said the WikiLeaks founder could be perceived as "running the show". According to the correspondence, which was obtained by the Spanish-language broadcaster Univision and shared with the Wall Street Journal, divisions over Assange have roiled Ecuador's government. Ecuador's ambassador to the US, Nathalie Cely, told presidential spokesman Fernando Alvarado that Quito's role in the drama was being overshadowed by the WikiLeaks founder, who has sheltered in Ecuador's London embassy for the past year to avoid extradition. "I suggest talking to Assange to better control the communications. From outside, [Assange] appears to be running the show." Earlier this week a senior foreign diplomat in Quito told the Guardian that some – though not all – factions in the government were annoyed with what they saw as Assange grandstanding. In a message attributed to Assange sent to Ecuador's foreign minister, Ricardo Patiño, and other top officials, the WikiLeaks founder apologised "if we have unwittingly [caused] Ecuador discomfort in the Snowden matter." The note continued: "There is a fog of war due to the rapid nature of events. If similar events arise you can be assured that they do not originate in any lack of respect or concern for Ecuador or its government." The document could have helped Snowden, whose US passport has been revoked, leave the transit lounge of Moscow's Sheremetyevo airport where he has reportedly holed up since fleeing Hong Konglast weekend. On Thursday, Correa, who previously has hailed Snowden for exposing US spying, and has earned kudos for defying Washington pressure over the affair, reduced Snowden's chances of making it to Quito. 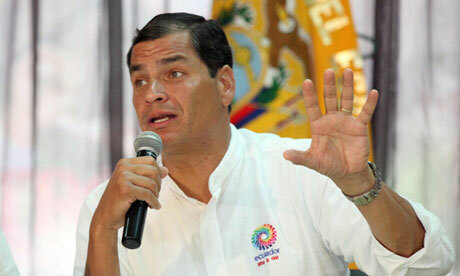 At a press conference the president declared the travel document invalid and said Ecuador would not consider an asylum request unless Snowden reached Ecuadorean territory, an increasingly remote prospect. "The situation of Mr Snowden is a complex situation and we don't know how he will solve it." Correa did however ramp up defiance of the US by waiving preferential trade rights to thwart what officials called Washington "blackmail". Analysts said Correa, an economist who specialised in game theory, had so far skilfully extracted political capital from the saga without drawing US retaliation. In a TV interview on Friday, Snowden's father said said he was worried about the involvement of WikiLeaks. "I don't want to put him in peril, but I am concerned about those who surround him," Lonnie Snowden told NBC. "I think WikiLeaks, if you've looked at past history … their focus isn't necessarily the constitution of the United States. It's simply to release as much information as possible." Snowden said he did not believe his son had betrayed his country. "At this point, I don't feel that he's committed treason. He has broken US law, in a sense that he has released classified information. And if folks want to classify him as a traitor, in fact he has betrayed his government. But I don't believe that he's betrayed the people of the United States." Snowden said he had told US attorney general Eric Holder through his lawyer that his son might return home if he would not be detained before trial, could choose the location for his trial and would not be subjected to a gag order. It was not clear that Lonnie Snowden was communicating his son's views, as he also said they had not spoken since April. After weeks of high-stakes international tension to find and apprehend surveillance whistleblowerEdward Snowden, US president Barack Obama indicated that he would not spend much geopolitical capital to make the former National Security Agency contractor stand trial in the United States. Obama said on Thursday he would not engage in "wheeling and dealing" to persuade foreign governments – principally Russia – to return Snowden to America, where he has been indicted on espionage charges related to his leak of classified information to the Guardian and Washington Post about broad NSA surveillance operations. Obama said he had yet to speak with the Russian or Chinese leadership concerning Snowden, emphasizing a desire to place trade and other bilateral issues ahead of the whistleblower. "I'm not going to be scrambling jets to get a 29-year-old hacker," Obama said, according to a tweetfrom the Washington Post's David Nakamura. Russian president Vladimir Putin confirmed on Tuesday that Snowden is in the transit area of Moscow's Sheremetyevo airport, awaiting a potential voyage to Ecuador, where he has requested political asylum. For five days, Snowden's mysterious flight from Hong Kong and future travel plans have captured global attention. "I'm sure there will be a made-for-TV movie," Obama reportedly said. Putin said that Russia would not extradite Snowden to the United States and asserted that Russia's security services had not been in contact with Snowden, a claim greeted with international skepticism given Snowden's knowledge of some of the most sensitive secrets about the US surveillance apparatus. Obama's remarks temper down days' worth of heated rhetoric from his administration about Snowden. The Justice Department on Sunday emailed reporters a detailed timeline about its efforts to work with Hong Kong to arrest and extradite the 30-year-old former contractor, pushing back against Hong Kong's public claim that the US did not follow the proper legal procedures to apprehend him. A US National Security Council spokeswoman warned that Snowden's departure might prove "detrimental to US-Hong Kong and US-China bilateral relations". An anonymous senior administration official went further, insulting Russia and China in the course of attempting to discredit Snowden – all while the Obama administration attempted to work with both countries on the issue, particularly Russia. "Mr Snowden's claim that he is focused on supporting transparency, freedom of the press and protection of individual rights and democracy is belied by the protectors he has potentially chosen: China, Russia, Cuba, Venezuela and Ecuador," the official told reporters in an emailed message early Monday morning. The main Chinese state newspaper, the People's Daily, shot back on Tuesday by praising Snowden for "tearing off Washington's sanctimonious mask". It remains to be seen what Obama will do to facilitate Snowden's extradition, or if his remarks indicate that Obama is deprioritizing Snowden after nearly a month of being vexed by his disclosures. On Sunday, Obama's director, General Keith Alexander, said Snowden "has caused irreversible and significant damage to our country and to our allies". Members of the US Congress have called Snowden a "traitor" and are likely to pressure the Obama administration to intensify its effort at bringing him to the US to stand trial. "I hope we'll chase him to the ends of the earth, bring him to justice and let the Russians know there will be consequences if they harbor this guy," senator Lindsey Graham said on Sunday. Edward Snowden: Can a refrigerator function as a Faraday Cage? Comments On: Edward Snowden: Can A Refrigerator Function As A Faraday Cage? In today’s New York Times article by Heather Murphy, a story was related where a group of lawyers were ordered by NSA whistleblower Edward Snowden to put their cell phones in the refrigerator before sitting down for dinner. The idea was that the metal-clad fridge would act as a Faraday cage, blocking any electromagnetic signals and preventing the group from being surveilled. This sounded a bit dubious, since a refrigerator is not completely sealed in metal. A counter surveillance designer by the name of Adam Harvey suggested that a cocktail shaker is a much better alternative. Curiosity got the best of me, so I decided to test out both. See the video above for the results. According to the Washington Post, the U.S. government has brought the hammer down on NSA leaker Edward Snowden, charging him with one of the most serious offenses: espionage. Snowden, who is holed up in Hong Kong, is currently searching for asylum with the help of fellow leak-enthusiast, Julian Assange of Wikileaks. Ironically, The Post and USA Today report that charging Snowden with a heavy political crime could make it harder to extradite him. “The treaty, however, has an exception for political offenses, and espionage has traditionally been treated as a political offense. Snowden’s defense team in Hong Kong is likely to invoke part of the extradition treaty with the United States, which states that suspects will not be turned over to face criminal trial for offenses of a “political character,” explains The Post. The extradition process could drag on for months. “Prosecutors now have 60 days to file an indictment, probably also under seal, and can then move to have Snowden extradited from Hong Kong for trial in the United States… Any court battle is likely to reach Hong Kong’s highest court, and could last many months”. The harsh indictment should worry those who fear Snowden will face the same treatment as Wikileaks source Bradley Manning who was reportedly driven to suicidal thoughts from “extreme” 23-hour-a-day solitary confinement. In an interview with Charlie Rose, President Obama refused to comment on how Snowden would be punished.